A treasure of a story with an amazing premise sure to tickle the fancy of every reader out there: Gläser’s story is not without issues, but I’m torn between wondering how much do they actually matter to the feel of the story, and did the blurb promise something that was, ultimately, unimportant. Amy Lennox and her mother Alexis live in Germany, away from the little Scottish island where Alexis grew up. When her mother decides that they will return to Scotland after a bad breakup, the story starts to take interesting twists. See, there are only two families on Stormsay: Lennox and Macalister, and in a convenient device, they don’t get along. But it is Amy’s grandmother Mairead who insists that Amy read – in ways that only those on Stormsay can: by jumping. Book Jumping: what a lovely way to spark imagination and show the joys of being lost in a story. Amy is in the books she reads: interacting with the stories as if she were written in. If you’ve ever been a reader who loses track of time, thinks about the characters after the last page, or even finds (or found) yourself imagining your place and actions in a fictional world: these moments are sparkling examples of deft writing, plotting and imagination. Gläser excels in the creation of Amy and her discoveries: her point of view and approach are spot-on, she melds with the stories she inhabits and shares that magic with everyone. Yet there were problems: the mystery hinted at in the synopsis was quickly and rather conveniently resolved, even as the ideas behind the thefts from the story were cleverly placed and offered plenty of options to drop clues and misdirect those intent on solving the mystery. Amy’s mother Alexis, is described as young but what is missing from her is the empathy gene. Spoilt and rather cold, she’s not particularly endearing – a trait that works well to show Amy’s desire to retreat in books and hints at a general unfitness for parenthood and a happy life. Other characters appear and disappear at random, and the underlying tension from the Lennox / Macalister struggles and competition wind through, adding a bit of misdirection that ultimately remains rather nebulous in the impression. Narration for this story is provided by Mary Sarah, and I think I have found a new favorite! Her ability to present appropriate accents, distinguish characters and allow the moments to take center stage without over-working emotions or tone gave the story a sense of solidity and presence. Amy becomes real and tangible with the combination of writing and performance, and her approach to each new adventure carries a sense of excitement and wonder. Each character is presented clearly, bringing the listener the ability to understand and feel what each is to bring to the story. Dangerous or questionable intentions are easy to recognize, as are the excitement and wonder woven through the story. A favorite listen for me for the writing and promise in the concept, the sense of Amy and her journey and the clear presentation that kept me engaged and hanging on every word. Amy's grandmother, Lady Mairead, insists that Amy must read while she resides at Lennox House—but not in the usual way. It turns out that Amy is a book jumper, able to leap into a story and interact with the world inside. As thrilling as Amy's new power is, it also brings danger: someone is stealing from the books she visits, and that person may be after her life. Teaming up with fellow book jumper Will, Amy vows to get to the bottom of the thefts—at whatever cost. Mechthild Gläser is an award-winning author in her native Germany. 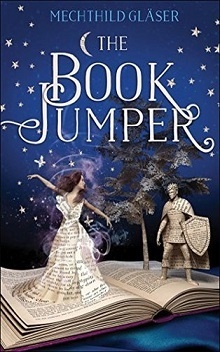 The Book Jumper is her first book to be translated into English.